The newest tablet from Google and Samsung's joint efforts, Nexus 10, is a powerful device that marries Samsung's best-in-class hardware, the latest version of Android-4.2 Jelly Bean, and the best of Google. With the world's highest resolution tablet display, all new multi-user support, immersive HD content and the best Google apps - Nexus 10 has something for everyone. More about the Nexus 10 after the jump. Nexus 10 packs powerful components inside a surprisingly lean, soft-to-the-touch frame – measuring an incredibly thin 8.9 mm and weighing just 603 grams, it's the perfect couch or coffee table companion. Nexus 10 was created in partnership with Samsung and comes with a blazing fast dual-core A15 processor and advanced MIMO WiFi, giving you web browsing speeds up to 4x faster than normal WiFi. With the 1.9MP front-facing camera, you'll look great as you video chat with up to nine friends at once with Google＋ Hangouts, and so will your friends on the dazzling 10" display. 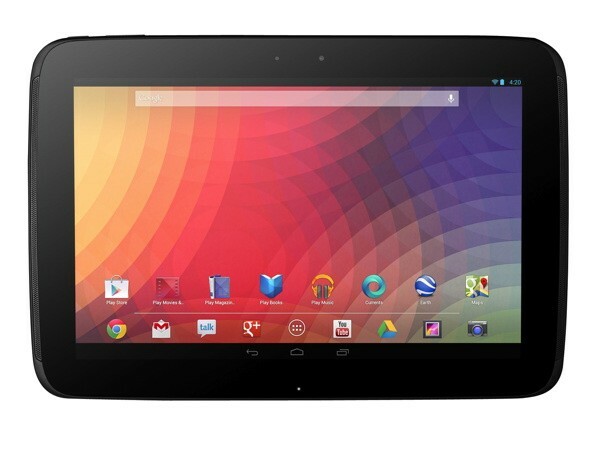 The Nexus 10 will launch on November 13th exclusively in the Google Play Store in U.S., U.K., Australia, France, Germany, Spain, Canada and Japan for $399 for the 16GB model, and $499 for 32GB model. waaaaa dualcore lang pero cortex a-15, WOWWWWW! !